1. The Deputy Secretary (UT), MHRD for information. 2. PS to Commissioner, KVS. 3. PS to Additional Commissioner (Admn. and Acad.). 4. 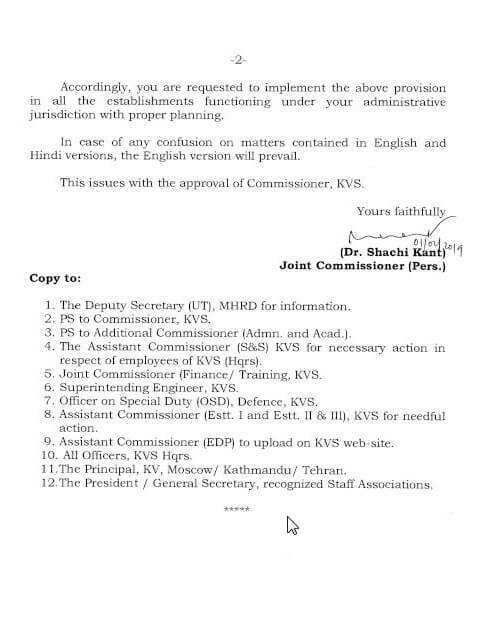 The Assistant Commissioner (S&S) KVS for necessary action in respect of employees of KVS (Hars). 5. Joint Commissioner (Finance/ Training, KVS. 7. Officer on Special Duty (OSD), Defence, KVS. 8. Assistant Commissioner (Estt. I and Estt. 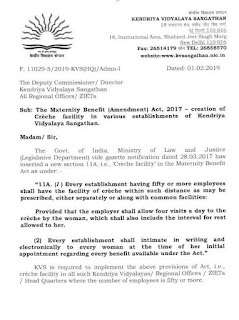 II & III), KVS for needful action. 9. 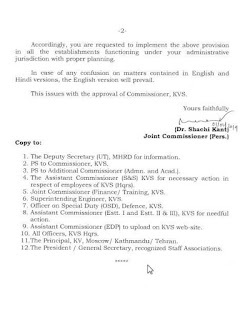 Assistant Commissioner (EDP) to upload on KVS web-site. 10. All Officers, KVS Hars. 11.The Principal, KV, Moscow/ Kathmandu/ Tehran. 12.The President / General Secretary, recognized Staff Associations.